In the wake of recent fatal pedestrian crashes, a law firm commissioned a study that reveals the most dangerous intersections for pedestrians in San Diego. In 2016, there were 103 pedestrian fatalities in San Diego County. Between 2010 and 2016, a total of 430 people were killed and nearly 8,000 injured in pedestrian crashes. According to the law firm Estey and Bomberger, the most dangerous intersection in San Diego lies in Hillcrest at the intersection of First Avenue and University Avenue. 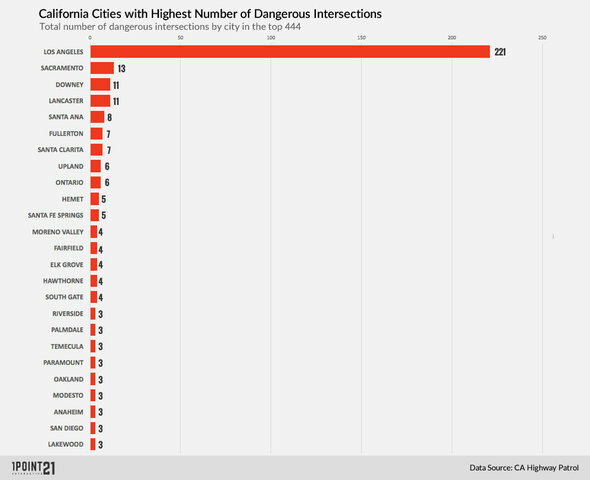 The below map shows the cities with the highest numbers of dangerous intersections in California. Los Angeles takes the top spot by far, followed by Sacramento. San Diego falls second to last on the list. Click on the map below to see more dangerous intersections in San Diego County.